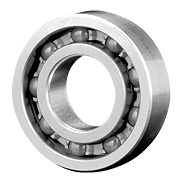 Deep Groove Ball bearings are the most common type and are used in a wide variety of applications. Not only are they capable of supporting radial loads but also moderate axial loads in either direction. Due to their low torque, they are suitable for applications where high speed and low power loss is required. They are easy to mount and suitable for many different configurations.